Fox News needed a strong, jingoistic image to support a feature on America’s borders recently, and apparently stumbled upon just the ticket: BioShock Infinite’s tarnished stars-and-stripes logo. 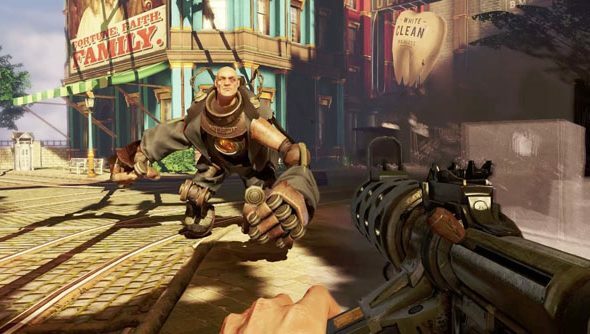 The broadcasters displayed the logo for Irrational Games’ meditation on race and prejudice throughout an interview with Texas governor Rick Perry about North America’s ‘immigration crisis’. “Isn’t that copyright?”, one fan asked on Twitter. “It’s irony,” replied Ken Levine. The doctored logo appeared in a segment named Fox & Friends, in which Perry invited President Obama down to the Mexico-United States border to see the ‘crisis’ in immigration first-hand. The game’s title had been replaced with the legend, ‘DEFENDING the HOMELAND’. It’s not clear whether anybody in Fox’s graphics department appreciated the joke. Players of BioShock Infinite will remember Columbia’s ruling party, the Founders – whose religious values were juxtaposed against their ultra-nationalism. They called upon the city’s people to be constantly vigilant against the threat of foreigners. Perhaps Fox and Perry will also find a border policy solution they like in Columbia’s floating city, eh?